My dear long distance friend Dianda lost the family furbaby a short while ago. You can read about Rosie here. I really love this pic of Rosie all stretched out, so I decided to do a portrait of her for D.
I haven’t got to do much art lately due to time constraints, other priorities, my two year old’s penchant for stealing my art supplies… Sometimes I worry I’m too out of practice, so I am pretty pleased with how the portrait is going so far. And a little bit afraid of messing it up. I’ll post the final whenever it’s done. I initially wanted it to be a surprise for D, but I was too excited when it started to look good, and who knows when I’ll feel like I’m finished with it. 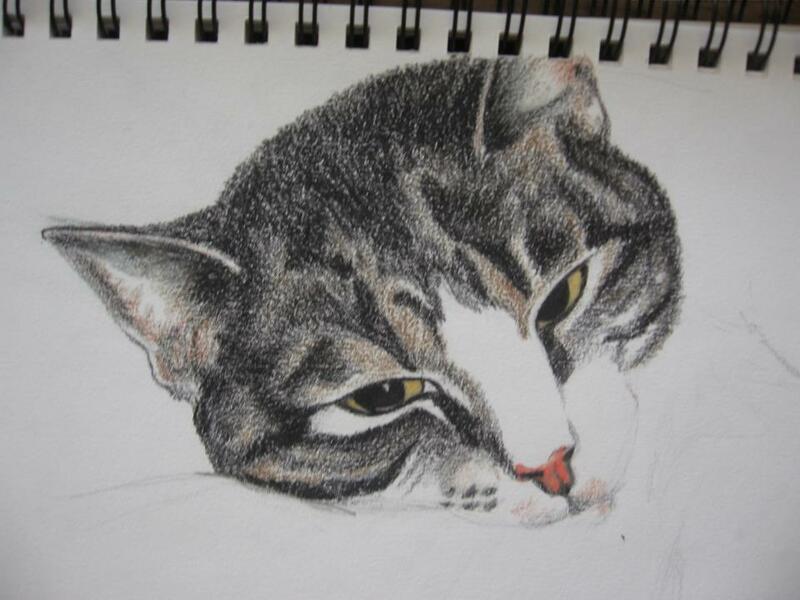 This entry was posted in JustBlog Entries and tagged art, art supplies, artwork, Cat, cats, colored pencil, Drawing, family pet, furbaby, pencil, pets, portraits, prismacolors, Rosie, sketching. Bookmark the permalink. Thanks! When it’s done, would you like the original, a print,( or do you have a photo printer and want to print it yourself?) I’ll bet once it’s done it’ll take me two freakin’ weeks to find a good day to get to the post office. Haha.